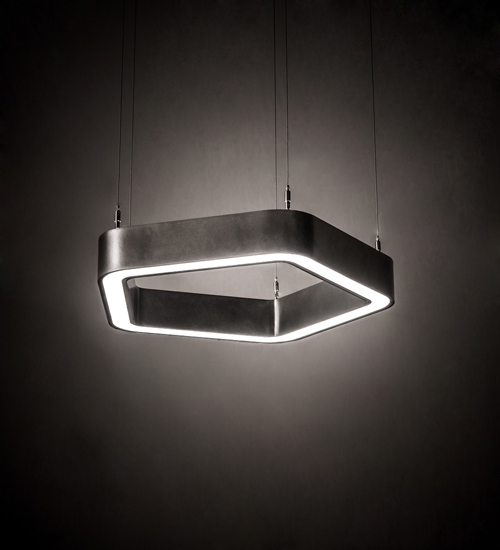 Description: A stunning lighting design, the Jefferson pendant beautifully illustrates an enchanting geometric style. The rugged metal frame and hardware are featured in a Sparkling Silver finish and enhanced with a Statuario Idalight lens that illuminates using Integral LEDs at just 45 watts with a built-in driver powered through aircraft cable on a low voltage system for energy efficiency, long life, and a clean look. Handcrafted in our 180,000 square foot manufacturing facility in Upstate New York, this pendant is available in custom sizes, designs, and finishes, as well as dimmable lamping options. The fixture is UL and cUL listed for dry and damp locations. Light output 45Lux measured at 87" below fixture.